I can't believe that it's that time of year again! This summer seems to have flown by...so I can honestly say that it kind of hit me as a surprise that it was already time for our annual back-to-school dinner! We celebrated this past weekend, with a casual, no-fuss dinner that was still full of all the fun. I'm all about celebrating real-life. It doesn't have to be fancy. It's all about the love behind it! For the kids treat this year I opted for some fun vintage candies (pop-rocks and rock candy) in their school color - which happens to be purple. 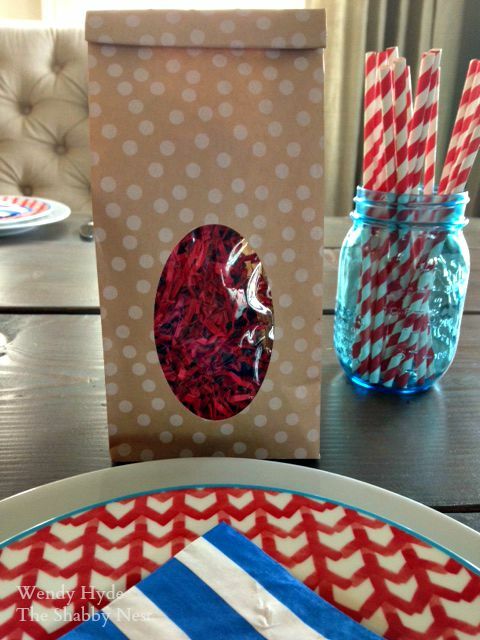 Since it didn't go with the color scheme I had in mind, I hid them inside these cute Kraft paper bags with red shredded paper filler. 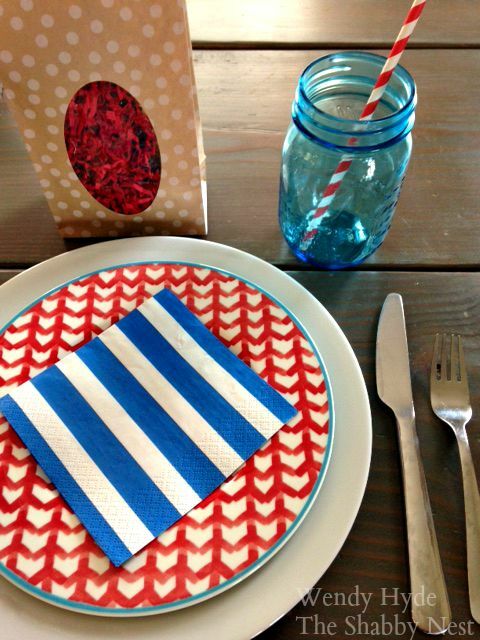 Here's another shot of the place setting...I just couldn't resist using my blue mason jars with the cute red striped straws. 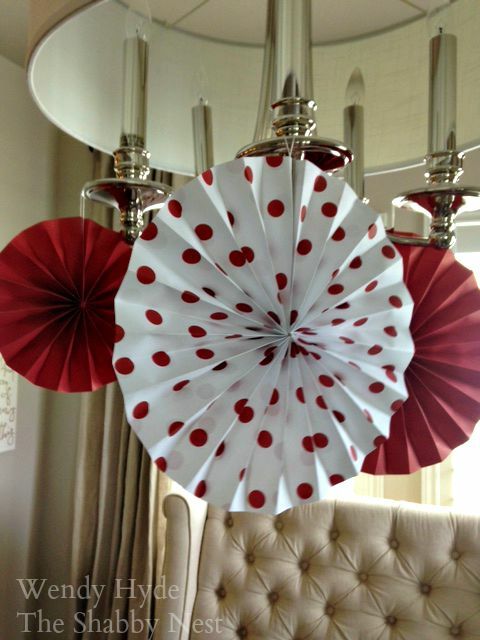 Red and white paper fans hanging from the chandelier made the room a little more festive. And I always have to have some type of bunting...I added the puffy stickers in a snap to personalize it for this year's dinner. Every dinner party is really about the dessert...am I right? And the dessert was really the star of this year's dinner. It was simple..as was the rest of the dinner...but check out the presentation! 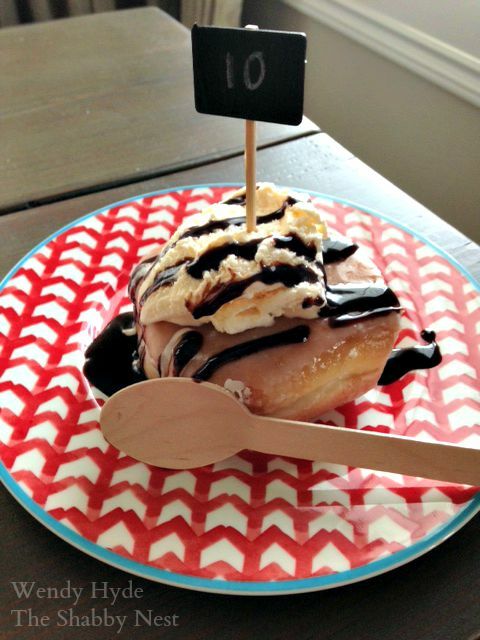 A glazed doughnut topped with ice cream and chocolate sauce...then I put a tiny chalkboard pick in the top with the grade number that each child is entering. I served the whole thing with a wooden spoon and it looked - dare I say - adorable! I can't believe that my house is going to be empty during the days once again. 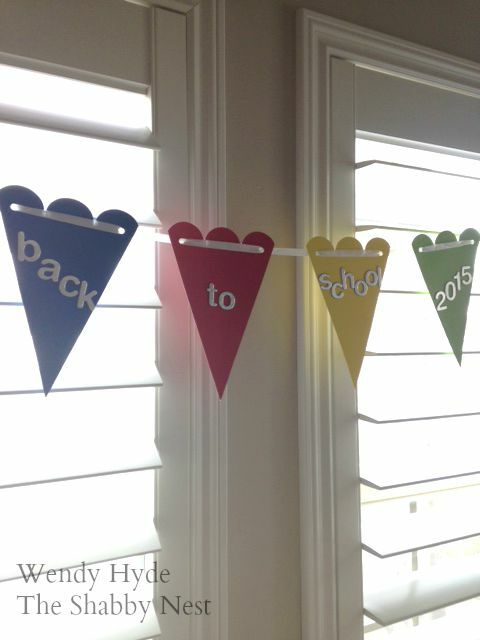 But I wish my sweet kiddos the best possible school year, with all the success and growth that comes along with that!